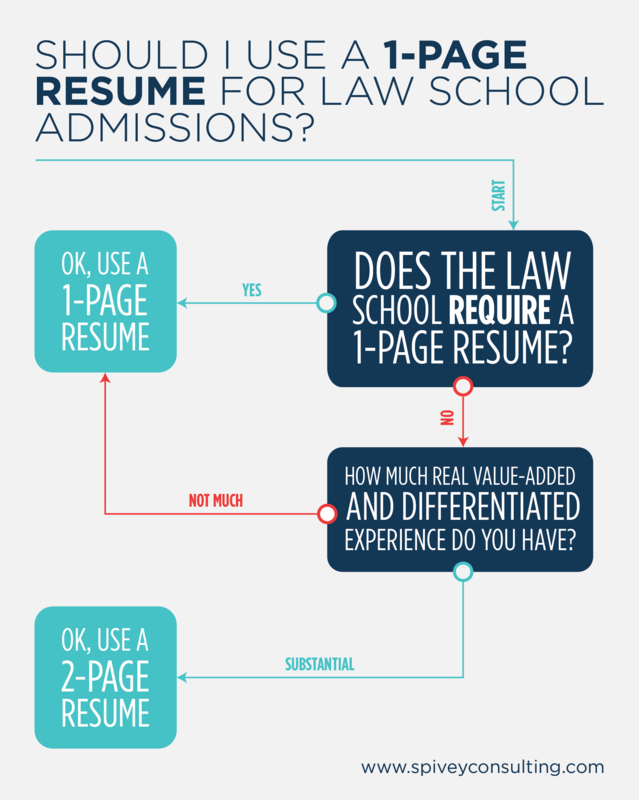 Let’s put an end to a false piece of advice that we recently saw on the internet — and more worrisome, that people give mixed messages on every year — about law school résumés. I won’t link the article because we are not writing this to personally call someone out, but it is written by someone who tutors for the LSAT. I imagine they are a wonderful LSAT tutor. The advice however, is about law school admissions, and is stated in such strong language it sounds like a near absolute. Thus, it is not only wrong, it is wrong while sounding like it is based on some kind of insider’s expertise. But, alas, the truth is that it is indeed still wrong. The article states, summarizing in our words, that unless you have utterly amazing military, missionary, etc. experience (less than 0.5% of applicants should fall into this category, says the article), your résumé has to be a one page. Let’s focus on the false notion, then, that your resume almost certainly must be a page; that there is some universal law school decree out there that it need to be so. That is not true. Between Karen, Jayme, and Mike we personally have seen thousands of applicants admitted with résumés of two (or rarely) more pages. Even more, some of these people stood out and got a “bump” because their résumés showed energy, continuous or prolonged involvement, experience, etc. beyond the typical applicant. To have chopped out large swatches of experience would have hurt these candidates in the application process. 2. Do your experiences and activities lend themselves to being value-added such that that you need more than a one page? It’s that simple. But a word of caution: it is likely very hard to determine how much value-added your own experience is, and certainly more than 50% of résumés should just be a page. But if you, your pre-law advisor, your objective friends, etc. all think your experience is great, please do not feel compelled to knock off some of the greatness to fit an antiquated notion of “one page.” That advice made sense in 1990 when I was applying for my first job, because back then we had amassed much less experience by our early 20s. Quite frankly, we were less talented across diverse arenas and areas of knowledge, and over time more and more opportunities to get involved (because of your talents!) have arisen for millennials and post-millennials. But even in the ’90′s, the “1-page resume” dictum had been handed down from a previous generation. These days, between academic honors, leadership and community service activities, and work experiences, many law school candidates easily fill 1 1/2 pages. And, that’s perfectly fine for a law school résumé. Just remember that you likely will be doing much more cutting when it comes time to create your job search résumé. And please don’t use razor-thin margins and 8pt. font to squeeze it all in to one page.